I love some of the changes, especially the new tagging. I have so often wished I could see more than three. I also love the ability to see from tagging just exactly how many people are tagged. Much quicker than doing a search and creating a list. Thank you! Ok, I am looking forward to the new version of Legacy 8. I have ordered my ink, toner, and reams of paper waiting to print the new user's manual. Is all the Version 7 training cds and other training material still be viable or do us faithful users of Legacy have to purchase new products? Change is good and I agree, it comes at a price and time to adjust. Legacy has been more than faithful back to its customers, and I will continue to support the company, and the people that support our questions and concerns. Keep up the good work! Jim - the existing training CDs can still be used, but I'm working on republishing them. It's been 5 years since volume 1 and longer than that for volume 2 so they need updating anyways. With the new tag option I'm in heaven. Yes, Millennia, v8 is on my "buy" list! Thank You! WOO HOO! Being able to see all 9 tags was on my wish list! Hallelujah for the tagging upgrades! Looking forward to syncing with FamilySearch Family Tree. Icing on the cake would be if Legacy were the first to sync source notes. Geoff, I think you have been reading my mind! Did your move to Idaho make that possible?? Just this morning I was doing some tagging and wishing I could see all of the tags. That was followed by changing the color coding to refer to my husband's family instead of mine while I did a bit of work on it - all the while wishing I could color code both independently and just leave it. I don't care what else gets upgraded - I'm already sold! I can't wait!! will save a step searching to see if a tag is being used. I am so looking forward to the new version. There are a lot of "little" things that kind of bugged me with 7.5 but I love it enough to recommend it to all the people that I have worked with as Family History Consultant. This is one of the easiest programs that I have ever worked with and I have been a Family Historian for 50 years. I have made excuse after excuse NOT to switch over to Legacy (yes, I DO have problems with change), but it seems that I may have run out of excuses. New version, new chapter in my family research. Seems no time like the present; time to make the leap! I would like a feature to add many people at once, like adding/linking parents and children in the same screen. It would save alot of time when adding many people. Thanks Geoff, Excited at the prospect but as yet you make no mention of the operating system, Windows 7 or 8 - perhaps progress & joined "Apple"??? I purchased Legacy 4 way back when. Would I be able to transfer all of that data into Legacy 8 easily? Thanks. Godfrey - it will work fine in either Windows 7 or 8, plus the earlier versions also. Lennie - yes, it will transfer fine into Legacy 8. I'm, so excited about seeing all 9 tags but even more excited with the tease about one set of colors for my line and another for my husband's. I already do that in my paper files. I will be so happy to have my husband's line finally color coded too. Awesome! Any chance that the "File / Open..." is being expanded to show the last 10 (or more) files that have been used, rather than the current limitation of four please? 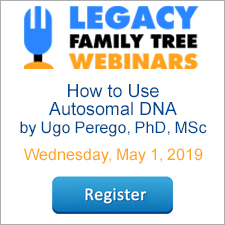 Do I have to buy Legacy 8 in order to Sync with FamilySearch Family Tree? 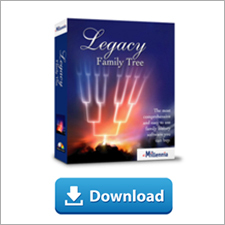 Or will the FamilySearch updates still work with Legacy 7? MH - yes, this has been expanded. Michelle - I'm not sure about this yet. Although it will be included in the free standard edition of whichever version it ends up in. Now if I could hover over Tag #1 and see something like "Geoff's Direct Line" or "Geoff's Direct Line (9086)" to remind me exactly what I used Tag #1 for, that would be pretty great! Version 8 sounds super, I'm looking forward to the upcoming teasers and even more to the actual program. Count me in! Dave - you can already do this via the Picture Center. What about more choices for printing descendants and ancestor lists, books, etc.? Sherril - really good idea. I'll see if we can make it happen. Ok now Geoff - you are a tease and keeping us in suspense for a while longer but in the end I am certain we will all upgrade and enjoy every little and big improvement as promised. Just keep posting these tidbits to keep us on pins and needles. Hoping we can use more than 4 colors OR that applied colors on some branches are NOT cleared when applying colors to other branches. For example, I use the 4 colors on MY 4 lines, but two other colors for my husband's lines. Hope the developers listened way back when, when I first suggested how much better it would be that way. Thanks. Paula - you'll be able to use either 4 or 8 colors for your first group, and either 4 or 8 colors for your second group. Geoff--what will be the upgrade price from 7.5 to 8? THANKS for a great software package! I love hearing about two starting points! That will make mine a lot easier:) THANKS! I'm glad you're including Mary Hill's lesson on color coding system for Family History. It's an excellent guide to organizing and staying organized in FH. I've used it for years and it really helps to keep things straight.